This week in Washington, D.C, Major League Baseball Commissioner Rob Manfred and I had the opportunity to address the U.S. Conference of Mayors at its 86th Winter Meeting. The Conference is a major supporter of MLB’s “Play Ball” initiative, which encourages children and teens to get outside and play baseball and softball, including through formal leagues, special events and casual games. 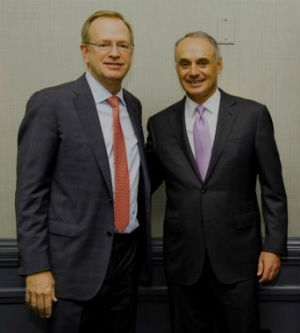 Commissioner Manfred and me in D.C. Boys & Girls Clubs of America is also excited to support this great initiative, which is aimed at energizing communities and reintroducing kids to the simple joys of playing ball. And, as they’re having fun running the bases and playing the field, they’re also engaging in physical activity that can foster an active, healthy daily routine. Over the past three summers, hundreds of mayors have initiated Play Ball activities with youth in their communities. Clubs joined in the fun, too, with more than 1,000 participating in Play Ball activities last year alone. It’s a great way to get kids outside and moving. That’s why I’m encouraging our thousands of Clubs around the country to join the fun 2018 by partnering with their mayor’s office to host a Summer Play Ball event. As the official charity of Major League Baseball since 1995, Boys & Girls of America has seen MLB’s commitment to engage children in communities across the country time and again. This summer, let’s give more kids, especially in underserved areas, the opportunity to play ball. Martin Luther King Jr. Day is not just a day off, but also a day on. Last Monday, Boys & Girls Clubs around the country celebrated Dr. King and his values by giving back to communities in many different ways. It was an important day for me and some friends, as well. Measure twice, cut once, as any carpenter can tell you. BGCA’s senior leadership team volunteers at a Club. 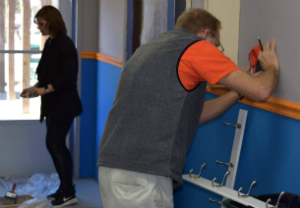 Last week at the Boys & Girls Club of Pulaski in Tennessee – a unit of the Boys & Girls Clubs of Maury County – Club staff and volunteers welcomed us for a day-long Clubhouse renovation. Improvements included Tech Center updates, new furniture, fresh paint, new gamesroom gear, the addition of big screen TV’s, and new restroom basins. That evening during an event celebrating the day of service, we discussed the importance of youth development and its impact on community. Speaking about her Club’s partnership with Maury County Public Schools, CEO Robyn Peery told us how a school tutoring program helped Club members advance to the next grade level. Through a unique data sharing agreement, the Club has access to academic information that enables it to show 96 percent improvement in at least one subject area. Last year, over 80 percent of Club members improved their GPAs. It was a privilege to help the Club continue its mission to enable all young people, especially those who need us most, to achieve their full potential as productive, caring, responsible citizens. 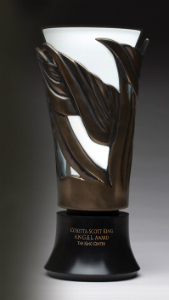 Postscript: On Jan. 13, The King Center in Atlanta presented Boys & Girls Clubs of America with The Coretta Scott King Organization A.N.G.E.L. (Advancing Nonviolence through Generations of Exceptional Leadership) Award for exceptional leadership in the areas of peace, social justice, and nonviolent social change, and further citing the work Clubs do on a daily basis to save and change the lives of children and teens. Clearly, this award belongs to the entire Boys & Girls Club Movement.